Old Tunnel State Park and Brazilian bats. "Since 1991, the old tunnel and 16.1 acres around it have been owned by the Texas Parks and Wildlife Department, which now operates it as a state park – Texas’ smallest. Some three million Brazilian free-tailed bats live in the abandoned tunnel from May through October each year, along with a much smaller population of Cave myotis bats." The first thing anyone notices while walking down the trail toward the old tunnel is the smell, the olfactory result of all the guano deposited by the 3 million or so bats that live there part of the year. Fortunately for visitors, the odor lingers only in a short segment of the half-mile trail that goes past the long-abandoned railroad tunnel and loops around what remains of the railbed that led to it. While the stench of bat droppings is transitory, what endures at Old Tunnel State Park 10 miles southeast of Fredericksburg are a couple of lessons symbolized by the 920-foot tunnel beneath a Gillespie County prominence called Alamo Ridge. The first lesson is a good example of the old saw that it’s best to be careful what you wish for. Founded in 1846 when ox-drawn wagons represented the state of the art in transporting freight, Fredericksburg was the last stopping place for Western-bound travelers for decades. However, by the mid-1880s Texas’ frontier had mostly faded and Fredericksburg, while still a good place to spend the night, had settled into a comfortable status as county seat and local trade center. Many Texas towns owed their existence to railroads, but Fredericksburg remained accessible by road only. Then, in 1887, the San Antonio and Aranasas Pass Railway connected nearby Kerrville (only 22 miles from Fredericksburg) with the Alamo City and points beyond. For the next quarter century, the powers that were in Gillespie Count tried to get rail service for their county seat. More than two dozen attempts to develop funding for a railroad connection to Fredericksburg failed for various reasons, but one man who kept at it was Temple Smith, a Virginian who had opened a bank in the then-predominantly German-American town. In 1913, teaming with engineer Foster Crane, who had been involved in the development of Medina Dam near San Antonio, the two men finally came up with the money to build the railroad, which would extend 24 miles from Fredericksburg to the existing trackage of the San Antonio and Aransas Pass (known as the SAP) between Waring and Comfort. But because of a 300-foot increase in elevation from that point to Fredericksburg, and the rugged hills that had to be traversed, it proved far more expensive to build the line than had been anticipated. The new route required either a trestle or a bridge for about each mile of its length, and at the highest point  Alamo Ridge  the tracks would have to extend through a tunnel. Workers used dynamite stuffed into holes drilled into the limestone with hand tools to blast out the tunnel. A team on each side of the hill worked to meet in the middle, digging in three levels so they wouldn’t have to use scaffolding, which would have raised construction costs even higher. For probably the same reason, the tunnel never had internal supports. The tunnel cost $134,000 to dig back when that was a huge amount of money. In fact, that aspect of the project caused a 67 percent cost overrun, an economic burden the line never overcame. The first train arrived in Fredericksburg in October 1913, but the official celebration of new rail service did not come until Nov. 18, when the railroad’s lone engine pulled a passenger car full of VIPs from San Antonio into the town’s new depot. Portending future trouble, the train rolled in three hours late. Never known for its on-time record, the new railroad line experienced delays because of chronic maintenance issues along its trackage. In addition to that, trains had to stop before going into the tunnel so that crew members could check for any large rocks that might have fallen on the track. Smaller rocks often pelted the roof of the train as it passed through the tunnel. Crippled by inordinately high debt and lower-than-expected demand for freight or passenger service, the railroad enjoyed only a brief period of prosperity during the late 1920s oil boom. But that ended with the stock market crash, and the road never again got out of the red. Finally, in 1942, it went out of business. The last train pulled out of Fredericksburg on July 29 and within a week, crews had begun ripping up the tracks. With another world war under way, the War Production Board purchased the rails for use in building a road to Alaska. Some of the tracks also were shipped to Australia. The second lesson offered by the old tunnel illustrates the law of unintended consequences. With trains no longer passing through the tunnel daily, it became excellent bat habitat. 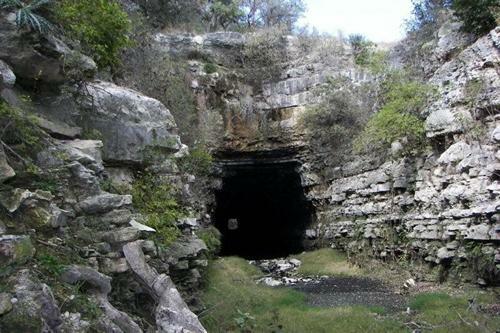 Since 1991, the old tunnel and 16.1 acres around it have been owned by the Texas Parks and Wildlife Department, which now operates it as a state park. Some three million Brazilian free-tailed bats live in the abandoned tunnel from May through October each year, along with a much smaller population of Cave myotis bats. As a popular tourist destination, the old tunnel brings more revenue to Fredericksburg than the railroad line ever did. 10619 Old San Antonio Rd.